With regards to Wisa of ‘Ekikimi’ fame showing his manhood on stage at this year’s City FM’s Decemba 2 Rememba show, his manager Konadu Boahen known as BB says him together with other members of Wisa’s label are willing to apologise. He said this in an interview with Jay Foley on Live91.9fm. According to the manager, his artiste got carried away by the massive response from the crowd and sharing a stage with great musicians as an upcoming act. “My artiste got carried away by the act and soon I will write and release an official apology letter. Especially to the patrons who received us with good acts on that day and to the organizers who gave us the opportunity to showcase our showmanship’” he said. It was fun as music lovers were treated with compelling performances by some mainstream artistes during the Decemba 2 Rememba music show held at the Accra International Conference Thursday. 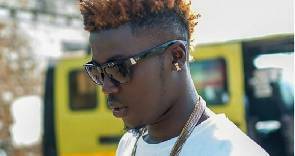 Up and coming Ghanaian act Wisa Greid of ‘Ekiki Mi’ staged an indecent act showing off his ‘manhood’ during the closing seconds of his craft.